Who Moved My Borscht? : When in Moscow...eat Georgian! 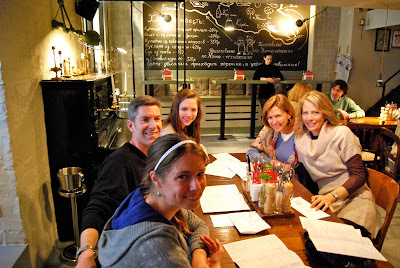 Steve with the Moellering girls at Khachapuri - our new fave Georgian restaurant! When in Moscow...eat Georgian...and we're not talking southeast United States. Georgian food is, in a word, delicious!! We had our first introduction during our Moscow “look-see” in August. Our good friends, the Grimes, recently re-introduced us in February - and now we’re hooked! Lavish Bread...also very popular - khachapuri- bread stuffed with cheese...heaven! You may remember reading about my "sledgehammer to the knees" incident going in the "out" at the metro (blog dated 2/21/11). My sweet sis-in-law, Amy, received a brief taste of the experience on her hand when she and Steve were passing the metro card between the gates - aaaaaagh!!! The "pain" of the metro....not nice to instill on visitors! Yum...Ann, your pictures are so perfect they made me salivate! We are STILL talking about that delicious Georgian food---I must see if I can find a restaurant in London. 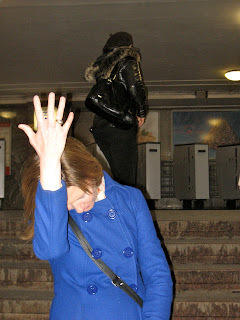 Thankfully, my hand has healed but the thought of the Moscow subway will always send a shudder through me!